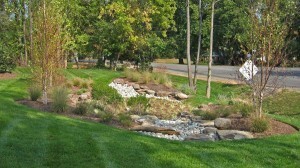 Need a stormwater control idea? Create a beautiful Rain Garden !! Stormwater is rainfall that runs off of roofs, driveways, lawns, roads, parking lots, sidewalks, farm fields, and other surfaces created or disturbed by manmade activities. This runoff picks up pollutants ( such as dirt, oil, litter, pesticides, fertilizer, etc. ) as it flows across these surfaces and eventually enters local streams. While rainfall is natural, stormwater is manmade. 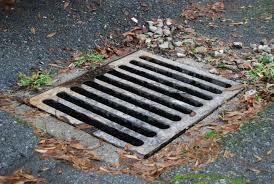 Large volumes of stormwater overwhelm, erode, and pollute local streams, and flood low lying areas. To lessen these destructive stormwater impacts and help ensure any existing problems do not worsen, municipalities across Chester County have adopted new stormwater management ordinance standards. These new standards are a key tool in reducing these stormwater impacts, safeguarding properties from flooding and erosion, and protecting streams and local water quality. • Properly dispose of hazardous substances, such as used motor oil, cleaning supplies and paint – never pour them down any part of the storm sewer system, and report anyone who does. • Look for signs of soil and other pollutants, such as debris and chemicals, leaving construction sites in stormwater runoff or tracked into roads by construction vehicles. Report poorly managed construction sites that could impact stormwater runoff to the Township. • Install innovative stormwater practices on residential properties, such as rain barrels or rain gardens, that capture stormwater and keep it on-site instead of letting it drain away into the storm sewer system. • Report any discharge from stormwater outfalls during times of dry weather – a sign there could be a problem with the storm sewer system. What is a Watershed ?